Frucor has launched Mizone Rapid in Australia with a television ad featuring a smashing game of tennis. Our hero replenishes his body and resumes the game. His oponent on the other suffers severe dehydration and begins to turn to clay. 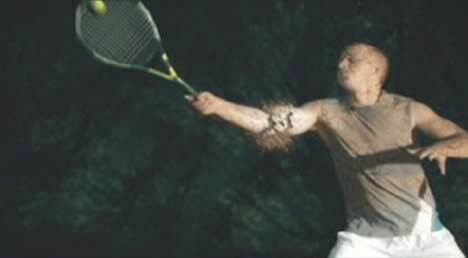 On receiving an incredible serve, the opponent reaches for the shot but instead shatters into a thousand pieces of clay. Mizone Tennis was shot over two days using an extensive amount of camera coverage and slow motion to reinforce the exhaustion one experiences in an extreme game of tennis. ‘Mizone Sportswater’ is for individuals who want to get the most out of life! ‘Mizone’ uplifts you and makes you feel alive, because it’s water with an enjoyable, light fruit taste and five essential vitamins. The range now includes five flavours (Mandarin, Lemon, Lime, Passionfruit and Crisp Apple) so has a flavour to suit all tastes. The brand was the first sportswater in the New Zealand market, launching in November 2000, and is set to continue to dominate the hearts and minds of all New Zealanders in the future. The Mizone ad was developed at Clemenger BBDO, Sydney, by creative director Rocky Ranallo and creatives Chris Berrents and Michael Dawson, and agency producer Roy De Giorgio. Filming was shot by director Nick Robertson via Plaza Films with producer Kim Kirby and director of photography Daniel Ardilley. Editor was Danny Tait at Tait Gallery, Sydney. Post production was done at Post Modern Sydney. Sound was designed by Rafael May, Rafael May Music.